Monster House, released in the cinemas in 2006, is soon to be released in a special Blu-ray edition – the disc containing both the high definition 2D and 3D versions of the film. This is the new 3D – meaning you’re going to need one of the new 3D-enabled, high definition TVs, it is not the old-school red and blue 3D technology. And any Blu-ray player will handle the 2D version of the film. In addition to the two versions of the film, the disc contains additional content, including eight featurettes, a filmmaker’s commentary and the “Art of Monster House” photo gallery. 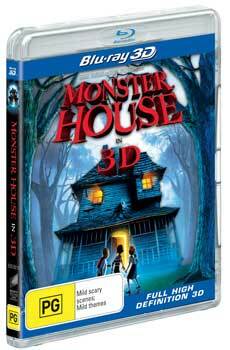 The Monster House 3D Blu-ray goes on sale on 15 September 2010, and has an RRP of $49.95.